Many young ladies and sometimes gentlemen have experienced being physically harassed at work. And more often than not, they won’t speak up, or even take action at the moment, thus allowing the perpetrators to continue their behaviours and actions on other subsequent victims. It is through many interactions with youth and young adults that we realise there is an inherent issue deeply entrenched in our controlled and manicured education, that didn’t equip our young ones with the ability to stand their ground in the face of bullying and harassment. 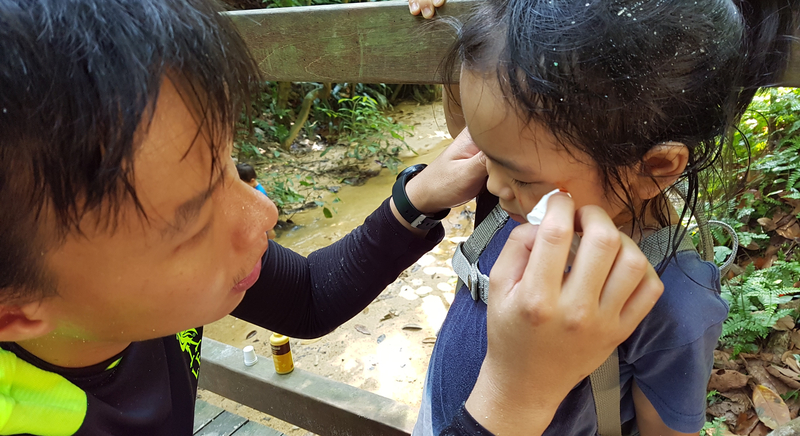 In Forest School Singapore, we do not encourage fighting or violence, but we accept the different ways of interacting and resolving issues that children show in our session. We do not condone bullying, instead we will reflect and remedy it, but with empowerment to all parties. To the “victims”, we empower them to have their own space and boundaries that they will protect independently. To the “bullies”, we empower them to use their strength and ability to lead, protect and load more responsibility instead of channeling their energy to drive fear in others, and we ask that they take up the challenge of ensuring everyone’s welfare and safety. We recognise both the kindness and sharpness of the parties involved. But many times in a forest school session, the lines are not quite clear between play fighting and bullying. Here is how we see it. Play fighting is a form of interaction among children, which usually entails a certain level of physicality and aggression in the role playing of fight. The limitation and boundaries that are drawn up, are fully decided by the children themselves. The most important aspect of play fighting is the intention – the imagination and motivation in the minds of our children. In play fighting, they may accidentally hurt their friends. A bruise or a cut, but never a bad injury that requires first aid. Children would immediately respond with a Sorry, a genuine Sorry, untainted, unconditioned. Bullying is an involuntary experience, where one individual carries out interaction that another individual doesn’t like or agree to. And it is usually done repetitively, without remorse, with intention to hurt. There are 3 different kinds of bullying – verbal, physical and psychological – that happens in a normal social setting. In verbal bullying, the bully uses words to “attack” or “tease” the “victim”. This is usually a two-way interaction. In verbal bullying, people can only be offended and subsequently hurt, if they allow the words to enter their minds and hearts. So, in verbal bullying, the victim plays a part in allowing the words to enter. They may not be able to control the words coming out of the bully’s mouth, but they have the choice of disengaging with the interaction, by turning a deaf ear and shrugging off the comments. I believe all of us adults, have experienced that in our lives, where it comes to a point that we just do not engage with certain comments about us because it’s not true. However, when verbal bullying crosses into physical bullying, that is when the interaction is probably one-way. In physical bullying, the bully uses physical action to “attack” or “strike fear” in the victim. The victim will usually be hurt in this interaction, regardless of the degree of hurt inflicted. In physical bullying, the victim cannot turn a deaf ear, because the engagement is not in the mind anymore, but on the body. Thus, the response has to come from the body, whether is it by standing up to defend or moving away. But more often than not, most “victims”, being in a bullied and fear- driven position, would freeze. During those times when the victim manages to stand up and defend himself/herself and prove himself a tough prey, the bullying usually stops after a while. Like animals, bullies tend to single out easier preys. In psychological bullying, the bully shows up in a multitude of channels, usually unseen by most authorities. It can sometimes be hidden so well, that even the victim wouldn’t know. Think along the line of “Stalking”. It is a psychological form of bullying. Psychological forms of bullying are the toughest to tackle, due to its invisible personality. It treads dangerously and causes trauma and extreme hurt when the line is crossed. There is no hard and fast rule to dealing with this form of bullying. It takes a village of people to alleviate this issue for the bully and the victim. It takes people to listen to the stories from both individuals without judgement. It takes people to watch out for one another in the community, so if anything extreme were to happen, there will be someone in the neighbourhood who could help. What are the remedies to Bullying? In remedying bullying, many institutions use punishment without relating and understanding. This leads to the bully going underground sometimes. Most bullying should be remedied by the individuals involved, because they are the best people to know what is going on emotionally, mentally and physically. However, as educators, parents or simply villagers who help raise our young ones, we can be there in their presence, supporting them through facilitation questions, and maybe sharing our stories of how we deal with our conflicts, and leaving the power of choice to our young ones. This way, they will take responsibility of their own actions and emotions. And no matter what the world brings to them in future, they will have the resolve to face them. Bullying, Play Fighting and other forms of physical play and interaction are not an easy space to understand and make sense of especially in our modern controlled society. With our ego and nose up high, we don’t see ourselves like our cousins or part of the animal kingdom. Even though, when stripped off the social construct, we are just like them. Understanding physical play and interaction comes from observing what animals do in nature. They play fight a lot, and sometimes, they step onto one another’s tail, but that’s also when they recognise the personal space of other individuals. Children learn about each other’s preferences, likes and dislikes through play and mistakes that they make in interacting with one another. But if we take away their opportunity to realise these, we will diminish their understanding of another individual’s right to choose, and the personal space of others. And down the line, they may not respect these aspects of life (Choice and Personal Space). They may not respect their own choice and personal space. And that may be the day where they choose to let someone else invade their space – without even a response. And through rough house play in a safe and free environment, I hope we can help drive a change in our education of our young ones, in terms of choice, personal space and respect.